Plurality want Mitt Romney to succeed him. Hatch finishes in a distant third-place tie among all possible candidates. (AP Photo/Charles Dharapak, File) Sen. Orrin Hatch. Three of every four Utahns say Sen. Orrin Hatch should not seek an eighth term, while a plurality would like Mitt Romney to take his place in the Senate, a new poll shows. “Voters are saying, ‘Please don’t run again.’ Many have fond memories of Senator Hatch, but they feel the time has come for him to step aside,” said pollster Dan Jones, who conducted the survey for The Salt Lake Tribune and the Hinckley Institute of Politics. 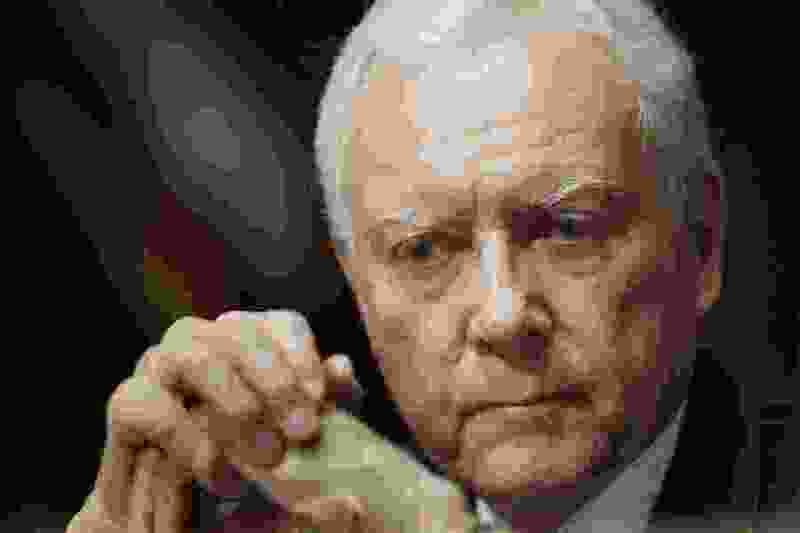 The survey shows that 75 percent of voters said Hatch — the 83-year-old Republican who was first elected 41 years ago — should retire, including 56 percent who said he “definitely should not” run again. While Hatch promised in his most recent campaign that this would be his final term, he is reconsidering and so far is undecided whether to run again. 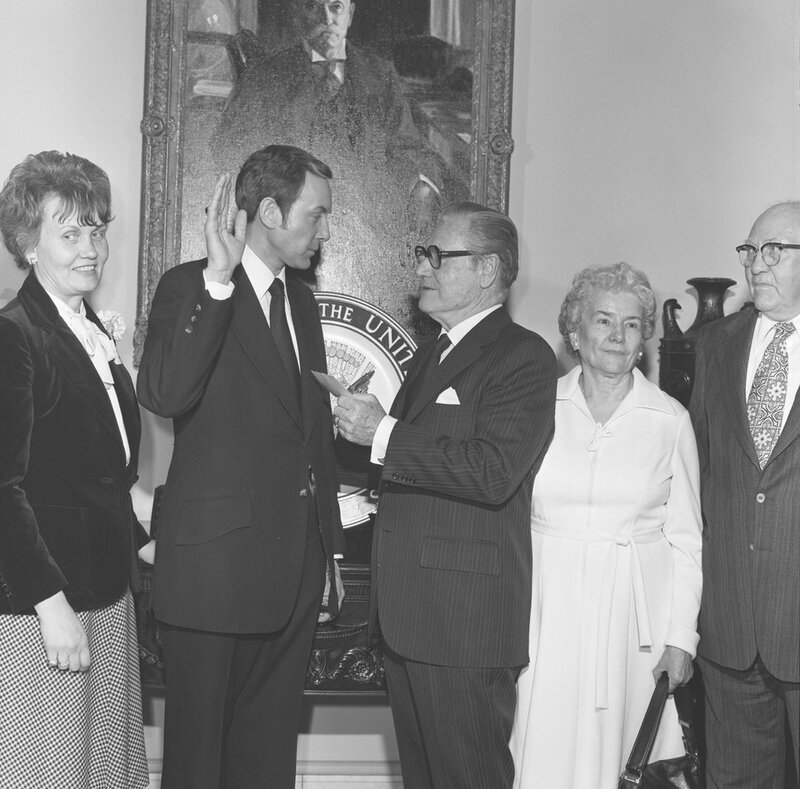 Photo Courtesy of U.S. Senate Historical Office Vice President Normal Rockefeller administers the oath of office to Sen. Orrin Hatch in January 1977, with his parents on the right and his wife Elaine on his left. The poll had more bad news for Hatch. It asked voters whom they would vote for if the Senate race were held today, and Hatch finished in a distant third-place tie. Atop that list was former GOP presidential nominee Mitt Romney, attracting 44 percent support; Democratic candidate Jenny Wilson had 15 percent; and Hatch and Rep. Mia Love — who has not talked about running for the Senate — tied at 8 percent each. Other Republicans mentioned as possible candidates trailed further behind, including Rep. Chris Stewart, 5 percent; Sutherland Institute President Boyd Matheson, 3 percent; Utah Valley University President Matt Holland, 2 percent; and state Sen. Brian Shiozawa, 1 percent. Among just Republicans who responded to the poll, 57 percent said they would vote for Romney, 13 percent for Hatch, 8 percent for Love and 6 percent for Stewart. Dave Hansen, political adviser to Hatch and his former campaign manager, said the poll findings “probably don’t mean a heck of a lot to his decision” about whether to run. “He has said he will make a decision based on his health, his wife’s health and whether he feels like he can make a difference for the state of Utah,” Hansen said. Hatch has a huge campaign account — $4.7 million in cash on hand — that gives him an advantage if he chooses to run and could scare off competition. His latest quarterly disclosure form shows he raised $945,000 — a strong hint that he could run — and he spent $325,000. The poll shows Romney could defeat Hatch. Romney has not said whether he is considering such a move, and he did not respond to a request for comments for this story. 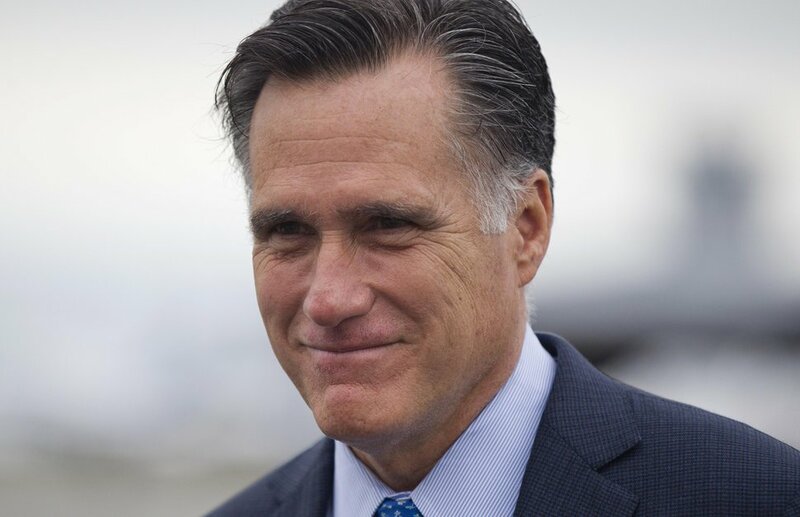 But Kem Gardner, a prominent developer and friend of Romney, said last month that the former Massachusetts governor would be interested in running for the Senate — if Hatch chooses not to seek re-election. Also, Hatch, in an interview with The Nation earlier this year, said he might be willing to step aside if Romney would run. Burbank notes that many Republicans talked about challenging Sen. Mike Lee last year, but no serious challengers actually emerged, raising the question whether the scenario could repeat next year if Hatch seeks re-election. The senator did face a serious in-party challenge the last time he ran by former state Sen. Dan Liljenquist, but Hatch easily won the GOP primary. 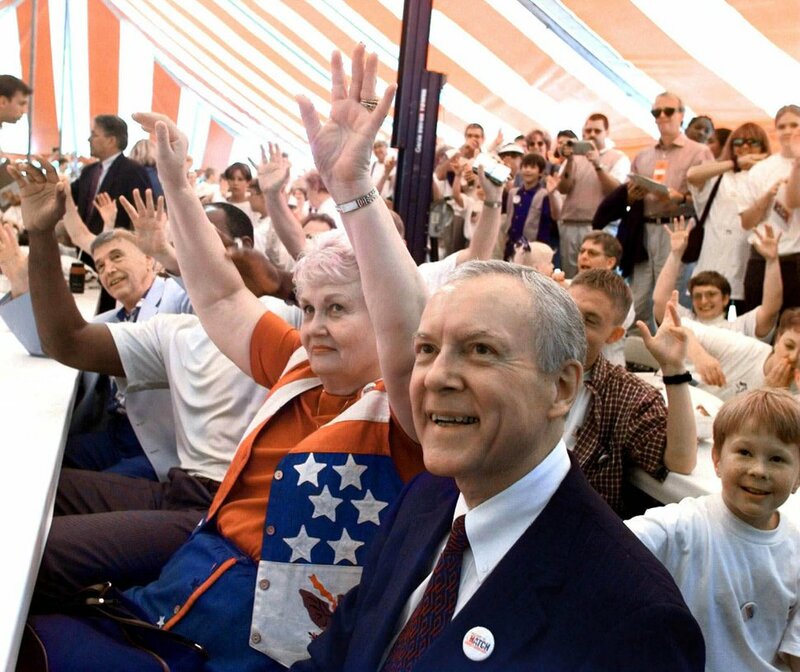 Some of the people who participated in the poll had expressed strong feelings about Hatch’s long service — which he started, ironically, by arguing that then three-term Sen. Frank E. Moss had been in office too long. Sharla Mindrum is a Democrat living in North Salt Lake. “Eight terms is far too many. He’s been in there so long, he’s not in touch with the people outside Washington. I don’t think he listens to his constituents, and I think he’s going to die in office” and refuse to leave otherwise. The new poll interviewed 605 registered voters between Oct. 10 and 13. Its margin of error is 3.98 percentage points, plus or minus.